How do I find a lost animal? We are proud of our community supporters, corporate donors, and partners. Unfortunately, we can’t list all of the individual donations, even though we are truly thankful. Every dollar and every can of food or warm bed donated helps keep a feral colony safe and helps save the life of a senior or special needs cat that might perish in a shelter. With the addition of our Love & Cuddles Pet Respite Care program, you also help pets get home to their family by supporting short-term care when owners are hospitalized. DreamHost deserves a big “thank you” for hosting our website for free–indefinitely! That’s pawsitively wonderful. These folks love animals and support local rescues. They walk the walk and adopt rescued animals too. If you need help dealing with bugs and lawn diseases and want to deal with a company that is also pet-safety conscious, give them a call. Great dog products and they love cats too! A huge thank you for making us their local rescue recipient for February 2017. Have you seen our wonderful videos for fundraising and recruiting volunteers and foster homes? We are a small organization and we couldn’t do it without the discount so graciously offered by Promo. Promo provides quality video clips, licensed music and a built-in text editor. It doesn’t get any easier, especially if you don’t have a dedicated media guru. Please, give them a try. Thank you Tomlinson’s for supporting our programs and our volunteers through discounts and donations! One of our most important partners is HOUSEPAWS MOBILE VETERINARY CARE. We are a proud member of the Banfield PARP (Pet Adoption Rewards Program) which insures that our adoptable pets receive great care and gives new pet owners a perfect start by offering discounts and advice to get everyone started on the right paw. A Uniquely Austin Pet Store that gives back to the community. We thank Lofty Dog for supporting us with events at their store and helping us reach the community. Do you know you can purchase gifts AND support our organization at the same time? Mention Austin Community Blooms, and Catnip Casa Cat Refuge over the phone, in store, or at check-out online, for 5% of your purchase to contribute to our cause. Thank you AutoZone for donating gift cards for our fundraising projects! Bissell donated a SpotClean Portable Spot Cleaner, which allowed us to put 100% of the funds earned from selling it at a special event toward helping the animals. We are proud to be a BISSELL Partner for Pets member! BISSELL and LostPetUSA.net have teamed up to help organizations like ours raise money, and you can help too! When you purchase pet products on bissell.com and enter the code ADOPT at checkout, a portion of the purchase will be donated to our organization! Please help us show our support by liking the BISSELL Pet Foundation Facebook page too. Free Pet Tips! No Spam. 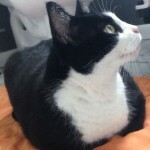 Amazon Wish List We always need food, litter, and other products important to caring for the senior and special needs kitties at Catnip Casa. Check out our list! Help us help them. Thank you. 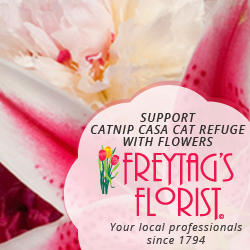 Remember, select Catnip Casa Cat Refuge on Amazon Smile when you shop for yourself and others. Every purchase earns a donation for the cats. Great News! We are now a member of Open Currents. Get paid for doing good. Digital currency anyone can earn by volunteering. Give time, create Currents. Learn more here. Catnip Casa Cat Refuge is a 501(c)(3). © 2014-2019 Catnip Casa Cat Refuge. A Texas Nonprofit Corporation.